In my garden, Texas bluegrass (Poa arachnifera) is going to seed after weeks of waving its feather duster blooms at me. The one or two I picked up at the Wildflower Center sale a few years ago multiplied to texture up a semi-shady spot under a mountain laurel. Like sedges, Texas bluegrass takes a few years to really fill in. Yucca pallida’s flower stalk couldn’t stand up to all the attention it’s getting. Viewer David Fuller asked: can we move yuccas and should they be hardened off like cacti? Daphne explains why we should harden off for a few days. “When you cut a succulent, it will ooze sap, which contains sugars. And those sugars are a very attractive food source for soil fungi and other microbes, so it needs to seal the wound before you return it to the soil.” Get her complete answer and why a new yucca may show up in that spot anyway. Now that warm weather is confirmed, we’re doctoring up our containers. John takes hanging baskets to new heights with native plants. To celebrate National Wildflower Week May 2 – 8, the Lady Bird Johnson Wildflower Center hosts daily activities all that week—even for the kiddoes! Click here for details and to download a cut & color coneflower mask, lesson plans for teachers, and activities for families. Now, true or false? Native plants like Barbados cherry are so tough that you can plant and walk away. If you picked FALSE, you’re right on target. Just because a plant is native doesn’t mean we’re off the hook to water. Andrea DeLong-Amaya, director of horticulture at the Lady Bird Johnson Wildflower Center, explains when to turn on the hose. Soil, of course, is a huge factor. One native plant that rots in heavy soils is globe or desert mallow (Sphaeralcea ambigua). Beloved by us for its silvery-green foliage and by pollinators for its cup-shaped flowers, Daphne reminds us that we shouldn’t overwater, especially when temperatures are cool or mild. Get all her tips on growing globe mallow, our Plant of the Week. Our Viewer Pick comes from Allison Floyd of Harker Heights who found this cute green tree frog in her basil. Allison says that she doesn’t live near water, but frogs and toads seem to flock to her yard. Thanks to Marc Opperman from the Capital Area Master Naturalists for his ID! On tour—the rainiest day in CTG’s history—we headed to Blanco last May to visit Sheryl-Smith Rodgers and James Hearn. A week after the disastrous floods, the rain kept coming. Finally we moved the interview indoors. Ed, Mark and I scooted outside to shoot between drenches. 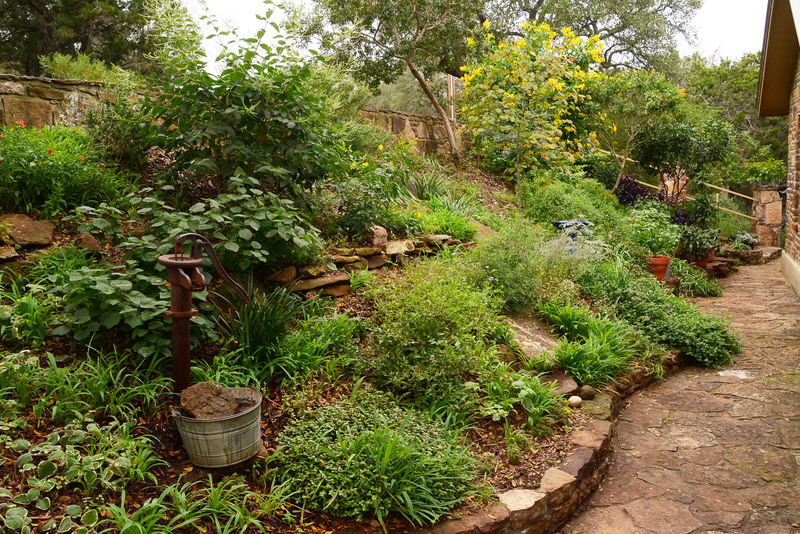 Sheryl writes for Texas Parks & Wildlife Magazine and I follow her incredible blog, Window on a Texas Wildscape, where she journals how she and James scrapped most of the lawn for dynamic wildlife habitat with native plants. These two are energy in action! One scavenged rock load at a time, they carved a sanctuary for themselves and wildlife. In 2012, Texas Parks and Wildlife designated them a Wildlife Habitat Demonstration site. Sheryl grows her collection at native plant sales along with seeds, transplants and divisions from around her property. Berlandier’s trumpets climbs a trellis. In her blog, Sheryl documents how she rescued valuable native plants, including many species of milkweed, including antelope horn. In 2008, they bought the vacant lot next door. When Sheryl recognized the valuable native plants in its seed bank, she nurtured them with timely mowing and invasive plant weeding. And wow! She took on city hall to stop mowing on the easement to protect nectar and larval natives. To seal the deal, James signified it with a parks-style sign. Hey, see the whole story now as they celebrate their 10th anniversary!